Not all blackwork needlework is done in black! 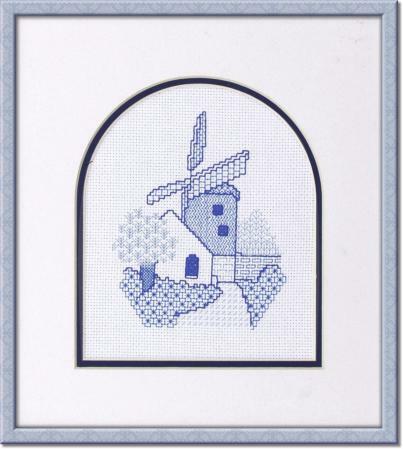 You will find many coloured blackwork designs here at needlework tips and techniques, including these pretty little windmills. Quick and easy to stitch they can be framed or mounted in a greetings card when finished. The buttons beside each picture allow you to order the chart and download it straight to your computer. If you are new to blackwork you might like to get yourself a copy of my blackwork for beginners ebook. Let's start with a cylindrical Tower Mill, made from brick. The cap on top of these mills could be turned, to position the sails into the wind. A delight to stitch with 9 different fill patterns and a little cross stitch. Blackwork patterns have been picked carefully to resemble trees, flower beds, brick walls etc. and are stitched in three shades of blue DMC embroidery floss. 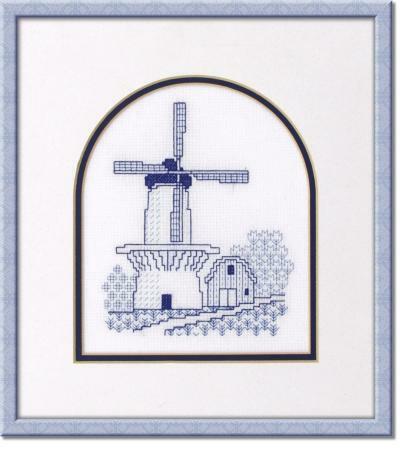 Our next blackwork design is a Smock mill, named after the garment farmers used to wear. Made from wooden planks in a hexagonal or octagonal form, again the cap can be turned into the wind leaving the rest of the building stationary. A typically English windmill, this type was often found in the county of Kent. This design uses 7 blackwork patterns. Lastly we have a open trestle Post mill, where the whole windmill is turned around a vertical post. Again English, these were, and still are, to be found in Kent and Cambridgeshire. 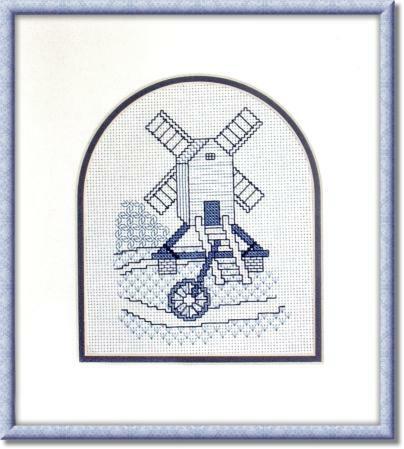 The easiest of the three, this blackwork needlework design only uses 3 blackwork fills and some cross stitch. 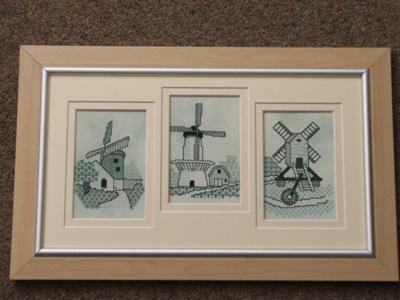 Erica from Cumbria, England, stitched all three windmills and mounted them very cleverly in one frame. Thanks for sharing your finished project, Erica, I love to see how people have interpreted and stitched my designs.